The Materia system was implemented in patch 1.19 and takes its name from Final Fantasy VII. In FFVII players could find and buy materia and slot it into their weapons. This gave your character new spells, summons and better attributes. The system in FFXIV: A Realm Reborn shares similarities with this in that materia slotted into equipment and gives you better attributes but unlike FFVII it is not a method of obtaining spells or summons. After completing the Life, Materia and Everything story quest you can unlock materia melding. 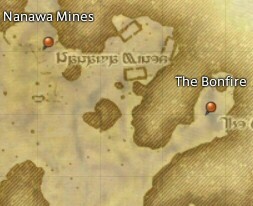 You will be sent to The Bonfire in Central Thanalan at 23,13 on the map and told to speak to Swynbroes. He will give you the "Forging the Spirit" quest. Upon completion of the quest you will receive a key item called a Materia Assimilator. This key item will allow you to create materia when certain conditions are met. Materia is created from equipment once its spiritbond has reached 100%. An item's spiritbond will increase through using it in your daily business by crafting, gathering and battling. Spiritbond will increase slower if you are below the optimal level required to equip it and if the gear is broken (0% durability) you will not gain spiritbond at all. The rate in which you gain spiritbond will be higher for high quality (HQ) items as well as those with materia already in it. Some equipment cannot be converted to materia, this is usually equipment that is obtained as special rewards from raids or primal battles. In 1.0 the type of materia you would get upon conversion was based on the slot of gear, EG body or head piece. In FFXIV: ARR the materia that is created is based on the type of class the gear is designed for. For example, a tanking piece of equipment like a Cobalt Cuirass which is worn mostly by MRD and GLA is more likely to create materia for tanks, whereas gear intended to be worn by mages will create materia that is more suitable for mage classes. By using your Materia Assimilator on a 100% spiritbonded item you will create a piece of materia. When an item is converted to materia the item is permanently lost. There are currently five tiers of materia, each giving a higher potency than the last. The higher the tier, the higher the potency on the materia. In FFXIV: A Realm Reborn there are no sub tiers of potency like there was in 1.0. Each tier of materia has its own potency now and that is the only one that exists. An example of the five tiers is below. When creating materia the tier you receive is largely affected by the level of the equipment piece. The higher the level of the equipment, the higher the tier of materia you can create. So for the best results of creating tier V materia you should be converting equipment of level 50 or above. Catalysts in FFXIV: ARR have been replaced and simplified into grades in the same way repair materials were a long time ago. Each grade corresponds to the tier of materia with the same number. 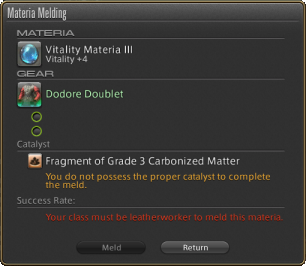 For example grade 5 Carbonized matter is used for melding tier V materia and below. Grade 3 can meld grade 3 and below but not above grade 3. Carbonized Matter is the only type of catalyst that currently exists. Carbonized Matter is obtained from the Botanist, Miner and Fisher classes while gathering and you will need to be higher levels for higher grades of Carbonized Matter. We're not sure exactly what levels will obtain which grade but common sense tells us the higher your DoL gathering node, the higher the tier. Before you can attach materia you must complete the "Waking the Spirit" quest given by F'hobhas at The Bonfire in Central Thanalan at 23,13. This requires you to be level 19 or above in Armorer, Blacksmith, Carpenter, Goldsmith, Leatherworker or Weaver. Once you are ready to meld materia you have to take into account the item level on the materia and the item. The item level on equipment must be equal or higher than that on the materia. Tier 1 materia requires equipment with an item level of 15 or above, tier 2 30, tier 3 45, tier 4 75 and tier 5 90. It should be noted that equipment's item level is not always the level a player can equip it. This scales up to 100 and is based on the difficulty or rarity of obtaining the equipment. For example the Dodore Doublet has an item level of 63 but can be equipped at 48. Additionally if you try attaching materia which is a bad match for gear on to it then your item level will need to be even higher to gain the full potency of the materia. For example attaching Vitality materia to equipment intended for magic players. We are unsure of the parameters on how this works. Once you have your materia, your catalyst and a piece of equipment you will be able to meld it all together if your crafting class is high enough level. Each piece of equipment is assigned to a crafting class, usually this means the class who can create the item can attach materia to it. If your crafting class is not high enough level then another player can perform the meld for you. The required level for attaching materia is written on the meld window. In 1.0 only the first materia attachment was guaranteed to be successful, but in FFXIV: ARR equipment can have up to 5 slots where melding is guaranteed to be successful, how many depends on the piece. If you would like to attach more materia than there are slots, this is called advanced materia melding and this comes with risks. If you wish to go beyond the safety of attaching materia to the designated slots then you can expect to be taking a risk. While it is less risky than in 1.0 it will still be risky if the chances of success remain the same. The reason it is less risky is because upon failure you no longer lose your item or the materia attached to it. Once you have your triple melded item you can not lose it. So you can then attempt to attach a fourth as many times as you like. You will however lose that new piece of materia on a fail. Due to the fact you are not starting from scratch every time we can expect this to have a different effect on the materia economy. People will try and try until they are successful and materia prices will rise, whereas before it was perhaps too much of a risk to try attempt a higher tier meld when you may lose what you have. Because Square enix is a inferior blizzard and try to retained some rubbish in its previous failed title. "I just found out the hard way, you MUST be the SAME class to attach the materia (I.E. I leveled a blacksmith to 19 and I just found out I can't attach materia to armor... I leveled the blacksmith TO attach materia so that was a BIG waste of time). " You leveled a BS to attach materia to armor? I don't suppose it occured to you that ARMORer might be a more fitting class for that task? Just sayin. "why do i have to be lvl 19 worker? i'm never gonna get to attach materia, stupid set-up!" And you can't make your own gear, food or potions either, you gonna complain about that too? Side note, I've been playin this game for 2 months now and I have 5 lvl 50 crafters, it's not hard. why do i have to be lvl 19 worker? i'm never gonna get to attach materia, stupid set-up! I like queefing, it's good for the soul. @ StoutYeoman: I just found out the hard way, you MUST be the SAME class to attach the materia (I.E. I leveled a blacksmith to 19 and I just found out I can't attach materia to armor... I leveled the blacksmith TO attach materia so that was a BIG waste of time). 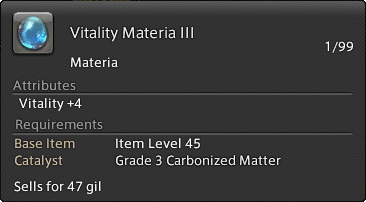 Can anyone clarify; does my crafting class have to be appropriate to the item I'm placing the materia in? For example, as a Blacksmith can I add materia to armor, or only to weapons? I crafted a Cotton Cowl HQ. has vitality 3, mind 4, intelligence 4 and critical hit rate 5. Has four materia slots. Slot one I put quick arm I (skill speed 2), second slot I placed an Intelligence Materia I. It should have given me an Int+1 bonus, but instead it has "Intelligence+ 0" written in red. My question and this now seems obvious, but looking for conformation. Does each piece of gear have a stat. cap? If you didn't play 1.0, catalysts are required ingredients for materia melding. The grade of catalyst required will match the materia. All gear has stat limits, sometimes the 1st material you try will already be at +0 for main stats like INT/MND/STR/DEX etc, because the item already is capped for the amount of that stat it is allowed to give for that equip slot. Hey MrWeavile. It does say that they are used for melding. It's simply a case of having the catalyst in your inventory when you go to meld the materia. It's helpful in a "guide" to actually say what things do i.e. what a catalyst actually does, instead of comparing it to something else. Stating the attributes of something that you have not explained let alone described is a bad move.